The use of electronic cigarettes or e-cigarettes (or e-cigs), commonly known as “vaping,” has become more prevalent, since e-cigarettes first appeared more than ten years ago. 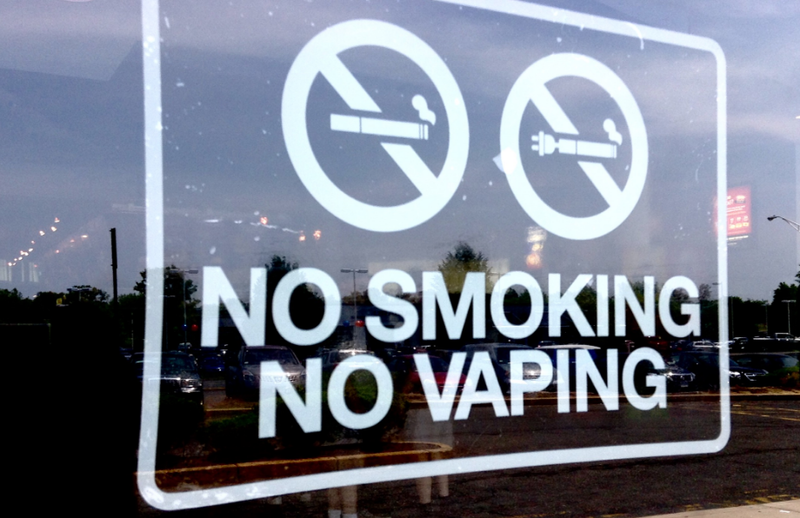 Primarily marketed to young people aged 18 to 24, the demand has increased so much so that vaping shops seem to be springing up in practically every shopping plaza. E-cigarettes are also available online. E-cigarettes operate by the use of an internal battery that heats a flavored fluid (“e-juice”) into a vapor, which can then be inhaled. The resulting vapor has little or no effect on the environment, an added benefit, and one reason why they are so much in demand. Among middle and high schoolers, who may not legally purchase e-cigarettes, the demand is the greatest. In fact, according to WebMD, three million of these students used e-cigarettes in 2015. According to medical health Web sites, vaping is popular due to a belief that it is healthier than smoking cigarettes. Some consumers believe that e-cigarettes can also help in the reduction of cigarette smoking. Advertisers claim that without the tar, contained in traditional cigarettes, e-cigarettes are a healthy alternative, and they draw in their customers by offering their product in many colors and flavors, including candy, ice cream, fruit, and more. E-cigarette devices also come in many colors and styles, adding to the attraction for young consumers. It is certain, there is a reduction in second-hand smoke. However, the effects to the e-cigarette user are not as clear. The obvious answer to that question is that, e-cigarettes still contain a third to a half of the nicotine in a traditional cigarette. Nicotine is an addictive drug with well-known health risks. In addition to nicotine, research has revealed that vaping also exposes the user to diacetyl, a chemical that causes respiratory diseases, especially bronchiolitis obliterans (popcorn lung). Due to lung irritation, asthma will get worse with e-cigarette use. Other effects are throat and mouth irritation, vomiting, nausea and coughing. Because e-cigarettes are not regulated by the U.S. Food and Drug Administration (FDA), content labeling is not required. Therefore, it is not known exactly how much nicotine or other chemicals may be present in each e-cigarette. Some are reported to contain heavy metals, formaldehyde, and other toxic substances. In a recent study, smoking nicotine was shown to permanently damage DNA. This may also be a risk factor for vaping. More research is needed. Here is what we do know. Nicotine, the main ingredient in most e-cigarettes, absorbs quickly into the bloodstream, and reaches the brain within ten seconds. Once there, the brain signals the body to release adrenaline and dopamine, which are pleasurable to the user. Adrenaline, the “fight or flight” hormone, increases heart rate, blood pressure (putting users at risk for stroke) and blood glucose (causing hyperglycemia and leading to possible insulin resistance or diabetes), and it lowers blood circulation to the cardiac muscle. As the high fades, the user feels tired and depressed, thus leading to the need for another dose. With each dose the body creates a tolerance, thus requiring higher levels of nicotine in order to feel the same as with the first puff. It is much like an addiction to other recreational drugs, such as cocaine, alcohol, and heroin. In fact, if the user tries to quit, he or she will likely experience withdrawal symptoms, such as headaches, anxiety, irritability, and continuous cravings for nicotine products. What’s more? Teens and young adults who are drawn to e-cigarettes are more likely to become regular smokers. This is ironic, since many people begin vaping in order to quit smoking. Smoking is one of the worse things you can do to your health. The best thing to do is to avoid nicotine addiction in any form, especially in your formative and reproductive years. If you or anyone you know vapes, and would like to stop, the steps are very much like those taken by a smoker who wishes to quit. (Please visit http://betobaccofree.hhs.gov/quit-now/index.html).